In recent years, China has evolved from the Middle Kingdom to the bubble kingdom. China experienced a massive real estate bubble that popped in 2014, only to be followed by a stock market bubble that popped in 2015. So far, the Chinese government has been able to contain the damage from these bursting bubbles with monetary ease, bailouts and market manipulation. But the biggest bubble of all — the credit bubble — may now be getting ready to burst. This has implications not only for China, but also for global capital markets. This article shows that bank lending is out of control through higher leverage ratios, “shadow” banking and so-called wealth-management products that even the chairman of the Bank of China called a massive Ponzi scheme. China’s hard currency reserves have been reduced from over $4 trillion to about $3 trillion over the past 18 months. The capital outflows have accelerated lately. As much as $1 trillion of the remaining reserves may be illiquid in an emergency (because they are represented by assets such as hedge funds, private equity and foreign direct investment). 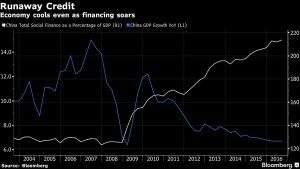 This means China may be down to $2 trillion with which to solve a $2 trillion credit problem. At some point, China could actually go broke and be forced to borrow from the IMF. That’s not likely in the short run, but the longer-term trends are not in China’s favor.